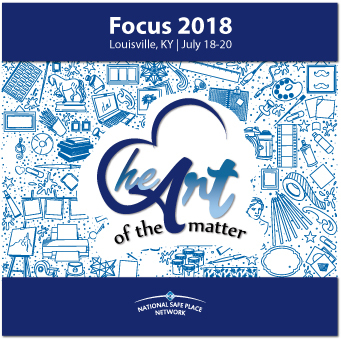 Focus 2018 "Heart of the Matter"
NSPN's national conference, Focus 2018: "Heart of the Matter," will take place July 18-20, 2018 at The Brown Hotel in Louisville, KY. Pre-conference institutes will be offered July 17. Focus 2018 provides opportunities for youth and youth service professionals to network with participants from across the country to share ideas, experiences, and knowledge. The theme, Heart of the Matter, highlights the reasons our work is important. It also highlights the launch of the NSPN campaign to provide a digital canvas for youth to share their stories through art. Click links below to read presenter bios. 9:00 a.m. - 10:15 a.m. - Opening Session & Keynote - "Listen Before You Lead"
YouthThrive* - This full-day, certification institute will highlight critical components of Youth Thrive, including: research on brain development, the impact of stress with focus on trauma-informed approaches, and the importance of creating and maintaining meaningful relationships with youth.To learn more about YouthThrive, please click here. Youth Mental Health First Aid* - This full-day, certification institute will introduce the unique risk factors and warning signs of mental health problems in adolescents, build understanding of the importance of early intervention, and teach how to help youth who are experiencing a mental health challenge. Mental Health First Aid is provided by a certified trainer and is designed for adults who work with youth. For more information about the training, please click here. Safe Place Basics - This afternoon session will provide information about key Safe Place program topics for those from existing licensed agencies and others who may want to learn more about program implementation and operation standards. Topics include: history and development of Safe Place, policies and procedures, implementation standards, education and outreach, and community partnerships. To learn more about Safe Place, please click here. Youth Empowerment - Youth, ages 12 to 21, are invited to participate in an afternoon pre-conference institute full of fun, networking, and empowerment. This institute provides youth an opportunity to get to know each other and discuss their involvement in the youth services field. Whether connection is due to receiving services directly or being drawn to the field in another way, each young person has an idea of what the “Heart of the Matter” is for them. This pre-conference institute sets the tone for Focus 2018 and helps young people consider their involvement in the movement to create a world where all youth are safe. Organizational Development - This track will feature sessions with content and experiences assisting organizations to provide the best possible services to youth and families. These sessions will address systems, structures, and practices that support organizational capacity and program sustainability. Professional Development - This track targets the “professional” needs of staff in youth and family serving organizations. Each workshop session should address advancing the skills of the individual worker. Training - This track will feature sessions for staff to enhance their efforts with youth and families. These sessions will target emerging or innovative approaches to serving youth. Safe Place - This track addresses topics specifically related to Safe Place implementation and outreach. It is appropriate for those responsible for the operation/coordination of Safe Place in their community. NEW! Youth Empowerment - This track will provide interactive sessions geared toward assisting youth participants with finding and using their voices to positively impact youth and family services as well as communities. Wednesday, July 18 from 9:00 a.m. to 10:15 a.m. The opening session of Focus 2018 emphasizes the voices of youth sharing their ideas of what it means to be safe, how they think safety can be achieved, and what participants should know to create change in partnership with others. The "fishbowl" experience of the session is unique. Youth will be talking to each other about these issues and participants will be "listening in" and watching the interactions without engaging in them. This format allows youth to focus on each other versus the audience. After the session concludes, audience members will have a chance to share the experience of what they heard as a bridge to moving forward in the event with change as the common thread. Thursday, July 19 from 9:00 a.m. to 10:15 a.m.
Linda Rutherford is Senior Vice President, Chief Communications Officer, for Dallas-based Southwest Airlines, the nation’s largest airline in terms of domestic Customer boardings. Linda ovesees media relations, special event planning, crisis communications, emergency response and business continuity planning, community relations and charitable giving, corporate community affairs, public relations, social business, multimedia and visual communication, legislative communication/grassroots activities, Southwest’s Speaker’s Bureau and employee communications. Click here to learn more about Linda Rutherford. Thursday, July 19 from 12:00 p.m. to 1:30 p.m.
A highlight of the Focus conference is the recognition of outstanding accomplishments of individuals, agencies, and organizations at the awards celebration. NSPN awards include: Safe Place Coordinator of the Year, Community Involvement, Executive Leadership, Lifetime Achievement, Model Program, Together We Can, and HEROES. Please join us for an excellent meal together as we celebrate and are inspired by our colleagues’ accomplishments at this year’s NSPN Awards Luncheon. Site visits will take place Thursday, July 19 from 2:00-5:00 p.m. EDT. There's no need to wait - register for Focus 2018 and select your preferred site visit today at: www.nspnetwork.org/focus-2018-registration. The Speed Art Museum was founded in 1925 in memory of prominent Louisville businessman and philanthropist James Breckinridge Speed. The museum is Kentucky’s oldest and largest art museum. Collections include African & Native American art, Ancient art, as well as collections spanning from the 1300s to contemporary exhibits. The museum recently underwent an extensive three year renovation that concluded in 2016, allowing for the addition of a state of the art theater. The Muhammad Ali Center was founded by Muhammad and Lonnie Ali. This museum and multicultural center is set-up with multimedia presentations, interactive exhibits, artifacts, historical videos, and images that reflect the six core principles that guided Ali in his personal and professional life. These principles are: confidence, conviction, dedication, giving, respect, and spirituality. The center was founded by the Alis with the goal of inspiring anyone, no matter their age, to experience a sense of personal growth through Ali’s own 6 principles. Opening their doors in 1986, Clark County Youth Shelter & Family Services (CCYS) began work on their four core goals: community education, juvenile delinquency prevention, information and referral, and youth advocacy. CCYS provides a number of programs for Clark & Floyd counties in Indiana, including: community education and outreach, crisis intervention, counseling, family education and support, anger management classes, and shoplifting prevention classes to name a few. In addition to these programs, they also provide a residential shelter for youth ages 10-18 and are in charge of the Safe Place programs in the two counties. YMCA Safe Place Services began as Shelter House in 1974. The only youth oriented shelter in Louisville, KY, Safe Place Services has the capacity to house 12 male and 12 female youth. In additional to providing shelter, Safe Place Services also boasts the Y-Now Mentoring program. This program pairs children who have one or both parents incarcerated with an adult mentor to help build positive relationships. Safe Place Services is also in charge of all of the Safe Place sites in Louisville, and operates a Youth Development Center that offers a drop in space, gym, laundry, fitness equipment, and a computer lab to help meet the basic needs of underserved youth. Focus 2018 will be held at the Brown Hotel located at 335 W Broadway, Louisville, KY 40202. NSPN has secured a reduced room rate of $149 (based on single/double occupancy in a deluxe room) for attendees. To obtain the discounted room rate, reservations must be made by calling the hotel directly at 502.583.1234 or 888.888.5252 and referring to the event "Focus 2018".You can also make reservations online. All reservations must be accompanied by a first night room deposit or guaranteed with a major credit card. Cancellations or arrival revisions must be received three days prior to the date of arrival, or result in a charge of one night's room and tax. Please check back for continued updates and information about Focus 2018. If you have any questions, please contact your NSPN team at [email protected] or 502.635.3660. You may also view details of past conferences including 2016 and 2014.